How do I take in consideration the "adc input impedance" to proper mesure the voltage on a voltage divider? What are the recommended values for the DUE? I'm calling the "Gain bug", the Gain or the multiplier that is used to correct the measure voltage from the voltage divider. I have set 6 adc ports to read the same input, in order to have a more accurate measure. The maximum voltage in this case is 12v but I wanna to use up to 18v. The problem I'm having is that the Gain multiplier that I have to use is not a fixed value. For example in the 100 + 10 or 10 + 1 the Gain is around 11 (I have properly mesure the resistor to make shore what the real value is on my case 10.985). But on my test I need to set it as low as 7.5 to measure a input voltage of 0.5v and as high I go I need to make the Gain bigger and bigger even above the 11 that I calculate. 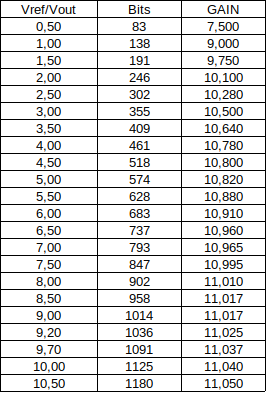 Here is a table with the values from the 10 + 1 voltage divider, the 100 + 10 are very similar and the 4.7 + 1 is better in the relation that the diference from the lower and the higher gain is lower (5.1 to 5.738). Go on. It is simple maths. Using 10k and 2k2 will give a suitable ratio. The ADC input impedance is in parallel with the 2k2. For example 1M0 input impedance is not going to make much difference. The ADC sees "source impedance" of 2k, 10k, 20k. I would advise using less than 20k.